While the excitement that surrounds the potential success of a mining company’s drilling results, a biotech’s trials or an IT company’s new proprietary software is always interesting, and definitely throws up investment ideas, sometimes it’s good to get back to an entity with predictable earnings that is easy to understand. Our stock of the week is such a company. Apiam Animal Health (ASX:AHX) operates in the Australian animal health market where it provides products and services to both commercial livestock and companion animals. The company's vertically integrated business model facilitates the generation of revenues from production of goods through to the provision of veterinary services, as well as the wholesaling and retailing of animal products and feeds. Apiam’s strategy is to service animals throughout their lifecycle, including the provision of veterinary services, ancillary services, genetics, wholesale and retail of related products, together with technical services related to food-chain security. The company has 43 clinics located throughout Australia, employing more than 150 veterinarians. Apiam delivered underlying earnings growth of 17.2% in fiscal 2018 on the back of revenue growth of 4% excluding acquisitions. This highlights the fact that the company is achieving margin growth through management’s initiatives to achieve efficiencies in the underlying business, as well as effectively integrating newly acquired complementary businesses. Looking across the fiscal 2018 performance, one of the standout features was the substantial uplift in operating cash flow which increased from $7.5 million in fiscal 2017 to $9.2 million. Management expects this strong cash conversion to continue in fiscal 2019, providing the company with the balance sheet strength to make further acquisitions while investing in its core business with a view to achieving solid organic growth. This is an important aspect in terms of Apiam’s long-term prospects, as history shows that companies which are overly reliant on acquisitions to generate growth often finish up laden with debt with nowhere to go as the business has grown in size but is floundering from an operational perspective. 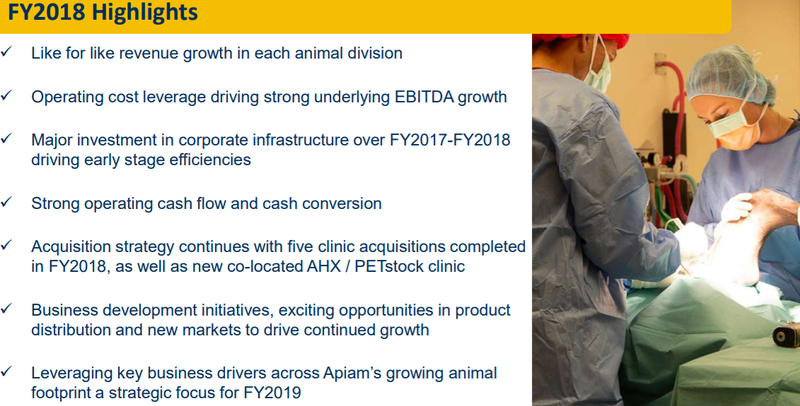 Apiam’s focus on efficiencies, cost management and investing in growth is evidenced in the following comments by managing director Dr Chris Richards who said, “Apiam has delivered another year of solid revenue growth, with underlying revenue growth delivered in each of our animal divisions. “The strong uplift in our underlying EBITDA margin reflects that our vertically integrated strategy is working, and that our corporate operating infrastructure is now beginning to deliver early stage cost efficiencies and savings as the business grows. “We have also generated strong cash flows over the period, which are funding our continued re-investment in business growth, particularly our acquisitions and capital expenditure program. Richards said he expected new revenue streams to be generated in fiscal 2019 as a result of bolt-on acquisitions and expanded product distribution. Apiam should reap the benefits of its internal initiatives, as well as experiencing robust earnings growth from acquisitions made in 2018 in the coming 12 months. The acquisition of two Victorian rural practices operating as the Terang and Mortlake Veterinary Clinic (TMVC) was the only acquisition completed in the first half of fiscal 2018. The acquisition of these clinics enables the company to grow its existing presence in Victoria’s Western district, and importantly expand its dairy and beef offering (services, products, genetics) in this region. TMVC has six veterinarians and is a diverse practice predominantly servicing the dairy industry, and is also active across the beef, equine and companion animal categories. TMVC generated revenue of approximately $2.2 million in fiscal 2017, and based on the agreed acquisition terms, the TMVC acquisition is expected to be earnings accretive for Apiam shareholders in the first year of ownership. Consequently, while making a small contribution in fiscal 2018, revenues from TMVC will have a much more substantial impact in fiscal 2019. The other acquisitions only had a nominal impact in fiscal 2018 as they were finalised in the second half. 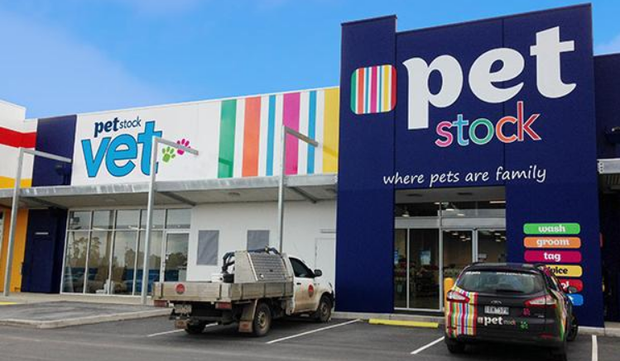 Expect the joint venture with PETstock and the acquisitions of Gympie and District Veterinary Services (Queensland) and Passionate Vetcare (Victoria) which were closed in June and February respectively to have a much larger impact in fiscal 2019. Another positive will be the exclusive distribution agreement struck with Plumbline Life Sciences in August. It is a leading Korean based animal DNA therapeutics company, and Apiam will exclusively distribute a number of its patented immunotherapy technology products in Australia and New Zealand, as well as having first right of refusal for exclusive distribution of future products in a range of markets. Commenting on this development, Richards said, “Apiam is well positioned to commercialise Plumbline’s innovative technology across our animal footprint, initially in pigs and dairy cattle. “We have a number of similar relationships under development and expect to continue leveraging new products across our client base in Australia and the US, via our new joint venture company, Apiam Solutions LLC”. While early-stage revenues will be nominal, distribution of the products has the potential to significantly increase group gross margins. Further to this development, Apiam recently established a US distribution company, Apiam Solutions LLC, based in Minnesota with joint venture partner, Swine Veterinary Center (SVC). SVC is one of the largest and well known swine veterinary groups in the world, servicing a significant percentage of the US market as well as consulting in a number of other countries. The partnership between Apiam and SVC, a long-term shareholder in Apiam, will see products developed by Apiam being distributed through the joint venture company in the US. SVC will provide technical, administrative and local management support. Products are expected to start flowing into the market in the second quarter of fiscal 2019 and the business is expected to be cash flow positive in its first year. The establishment of Apiam Solutions LLC also provides a pathway for commercialisation and distribution to the US pig industry as Plumbline’s pig products are approved for use in North America over the next few years. 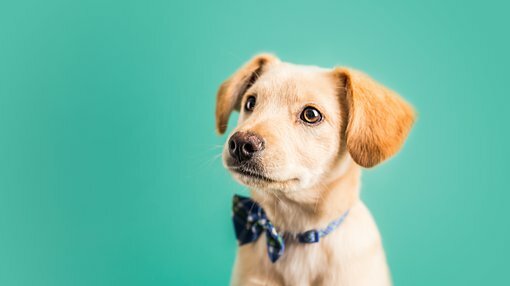 In February 2018, Apiam announced that it had entered into a joint venture alliance agreement with PETstock, a leading specialist petcare provider. This will not only provide additional revenue streams, but add another link to Apiam’s vertically integrated business model, assisting it in the vital area of supply chain management. Under the agreement, Apiam and PETstock will open a number of new veterinary clinics to be co-located at various PETstock retail outlets. The co-located clinics will be jointly owned, with Apiam as an 80% shareholder and PETstock as a 20% shareholder. The first co-located clinic, the General Practice, Emergency and Referral Centre at PETstock’s superstore in Bendigo (Epsom), opened in March 2018. It has outperformed early stage revenue expectations, achieving around double the amount of revenue forecast for its first quarter of operations. A second co-located clinic opened at PETstock Golden Square (also in Bendigo) in mid-August 2018, with additional clinics to be rolled out in targeted regional and rural locations throughout fiscal 2019. While Apiam’s shares have increased 20% to 64 cents in the last week, they are coming off a relatively low base, and given the consensus 12 month price target is 80 cents some brokers must be expecting further upside. The price target which implies share price upside of 25% appears achievable as it represents a forward price-earnings multiple (PE) of 13.8 relative to fiscal 2019 consensus forecasts. This is a significant discount to the sector average multiple of 18.3, suggesting that there is also scope for a PE based rerating. Though the major ASX listed player in the sector, Greencross Ltd (ASX:GXL) is currently trading on a forward multiple of 12.6, consensus forecasts for fiscal years 2019 and 2020 imply subdued growth of 1% and 5.4% respectively. By comparison, Apiam’s consensus forecasts imply growth of 21.4% and 15.5% in fiscal years 2019 and 2020 respectively. Perhaps the considerable publicity regarding drought affected regions has placed a drag on Apiam’s share price, but as the following graphic shows the company’s diversification is such that it is still achieving robust like-for-like revenue growth.